Sweet and a little salty. 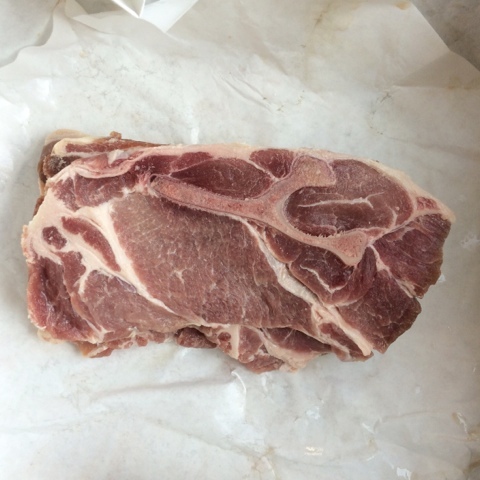 Creamy and a little crunchy. 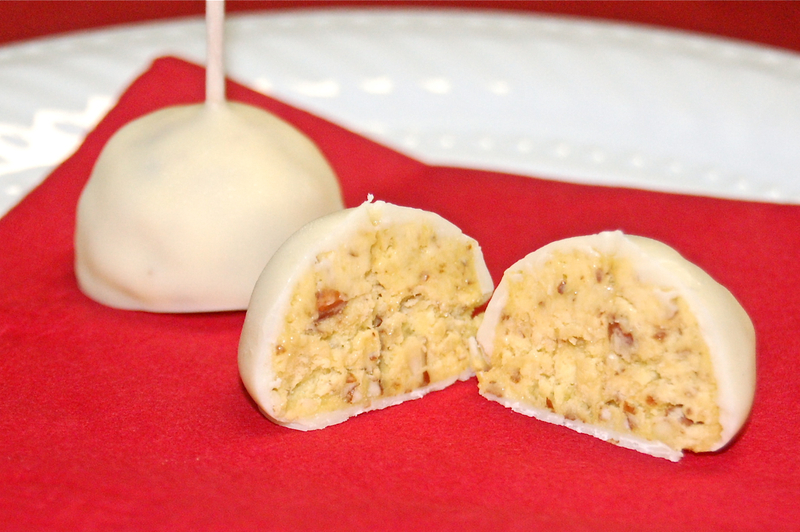 These melt-in-your-mouth bonbons are unbelievably tasty treats. I come from a family of frosting lovers. You know those people who scrape the frosting off their cake and leave it on the plate? Well, that wasn’t anyone in my family. I love frosting, too. But I like frosting that’s not overly sweet and has a little flavor. So I was always trying new frosting recipes, in search of a perfectly balanced frosting. I finally found that frosting: French buttercream. Well, my version of French buttercream, anyways. I don’t have a stand mixer and I don’t want to mess around with hot sugar syrup, so I use a different method of preparing this egg yolk-based buttercream. And then I add a little powdered sugar – a sin in the eyes of true buttercream fans, maybe, but it greatly improves the texture. The resulting buttercream always gets fabulous reviews. Paired with basic yellow cake, the kids think it is so good that Dan told me I should enter it in a baking contest. I had a different idea for the frosting: making buttercream candies for the holidays. The idea evolved a little more after I dipped an almond in some leftover frosting. I chopped up some almonds, added them to the leftover frosting, and created a candy filling fit for a frosting-lover’s dream. 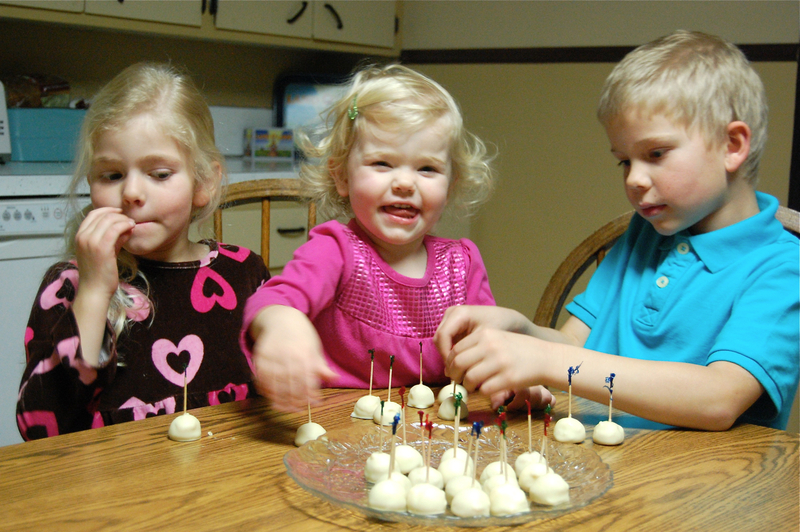 I made the filling into centers, dipped them in chocolate, and had my family test the result. Everyone loved them. What’s not to love about a bite-sized dollop of buttercream frosting enrobed in chocolate? And they love that they’re served on a frilled toothpick like a treat at a fancy party. 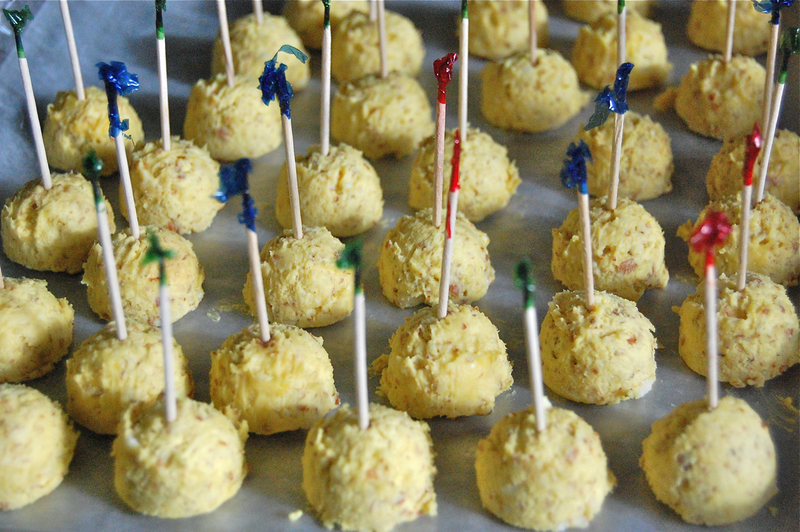 Dan and Monika have already asked me to make these for their birthday parties. All Daphne said after trying one was, “More, please.” I think I’m raising a new generation of frosting lovers. In medium (3-quart) stainless steel bowl, thoroughly whisk together milk, sugar, and salt. Then whisk in egg yolks. 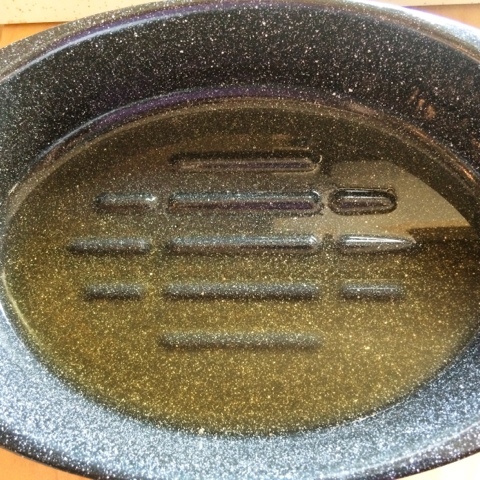 Add 1 inch water to medium (3-quart) pot and heat on low setting. 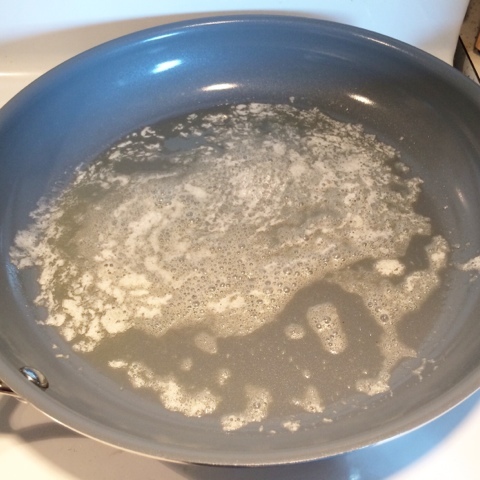 When water starts to barely steam, set bowl of egg yolk mixture on pot. 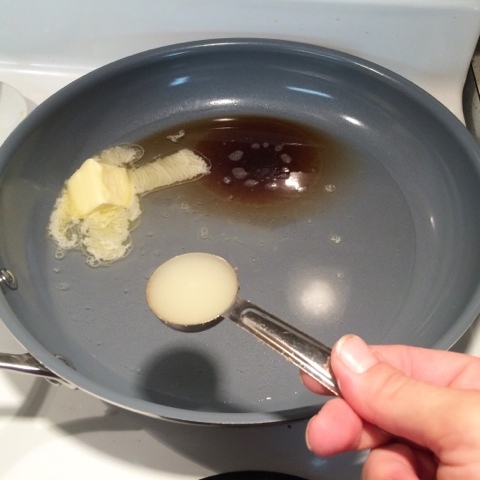 Using rubber spatula, stir constantly, but slowly – sweeping bottom and sides of bowl – until egg yolk mixture reaches a temperature of 160°F. 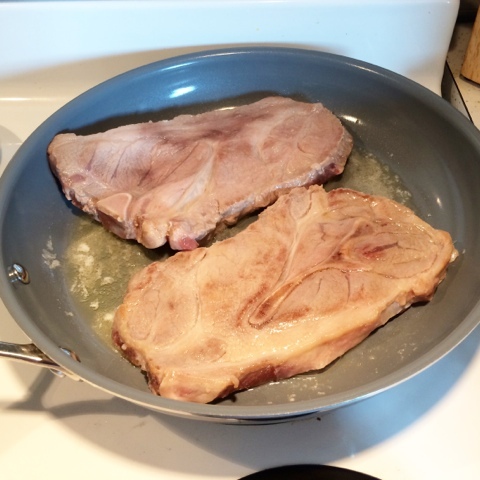 This will take about 8 minutes. 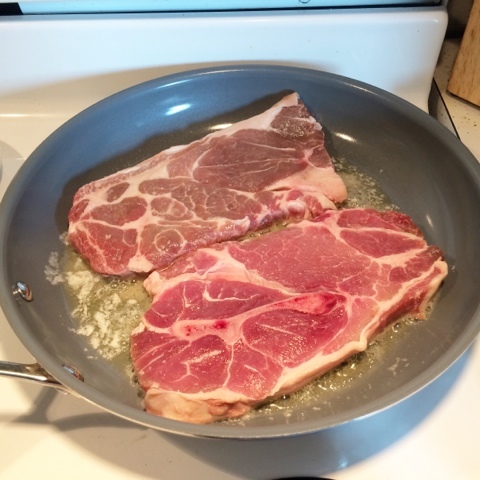 Once mixture is cool, add vanilla and two tablespoons of butter. 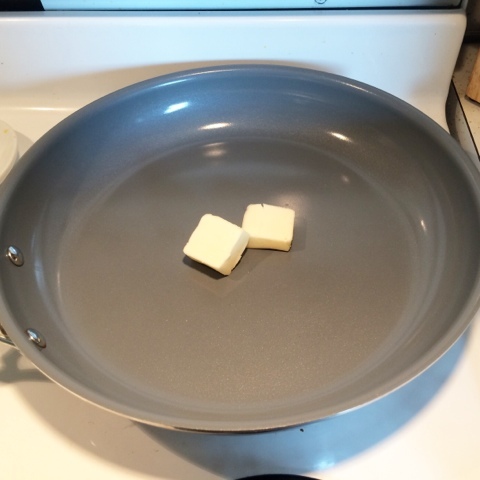 Beat until butter is completely incorporated. 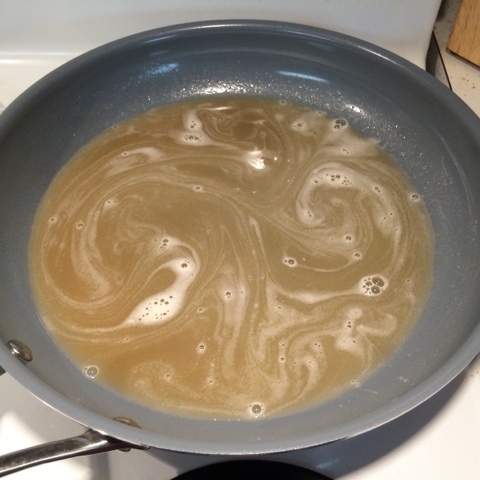 Continue, adding two tablespoons of butter at a time and mixing completely, until all butter is added. Add powdered sugar, in two parts, mixing well after each addition. 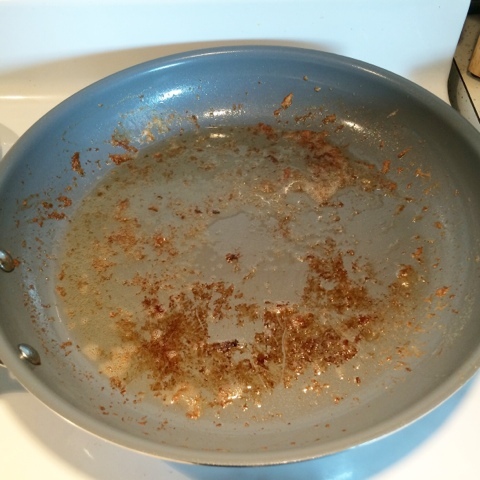 Fold in finely chopped almonds. Cover bowl with plastic wrap and freeze for 30 minutes (or refrigerate overnight). Once filling is chilled, scoop onto waxed paper lined baking sheets using small (#100) cookie scoop, dividing the centers between two baking sheets. Place one frilled toothpick in each scoop of filling. 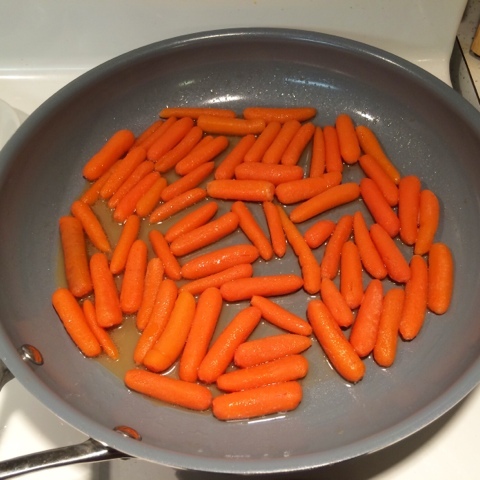 Freeze scoops of filling for several hours (or overnight). 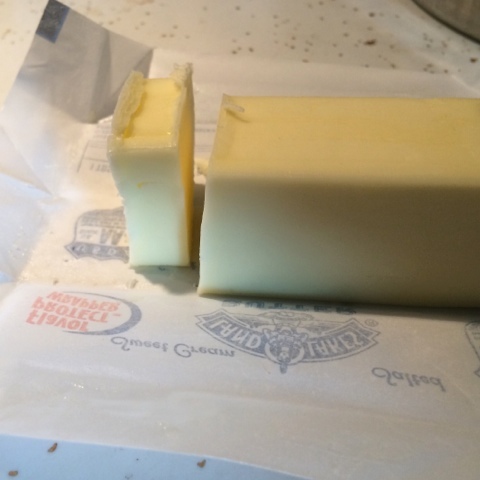 Break white chocolate into squares. Place chocolate and shortening in small (2-quart) stainless steel bowl. 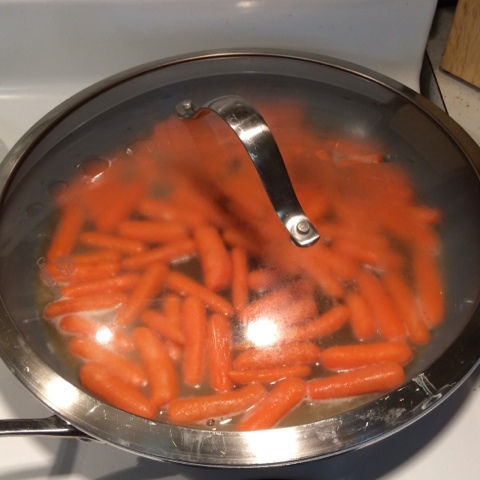 Add 1 inch of water to small (2-quart) pot and bring to a boil. Remove pot from heat, set bowl of chocolate on pot, and let sit for 10 minutes. Stir to finish melting chocolate. Place pot of water and bowl of chocolate back on burner set at lowest possible heat. Working with half of the bonbon centers at a time (leaving the other half in freezer), dip bonbon centers in chocolate. Holding a bonbon center by the toothpick, use a spoon to pour melted chocolate over center. Make sure chocolate covers center all the way to the toothpick. Dip the bottom in chocolate, if necessary. Once covered, tap the toothpick against the handle of the spoon to shake off excess chocolate. The goal is to cover the centers with the thinnest coating of chocolate possible – too much chocolate will overpower the flavor of the centers. 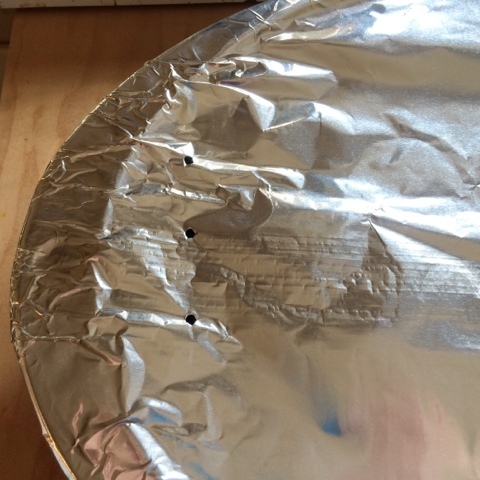 Place covered center on baking sheet lined with waxed paper. 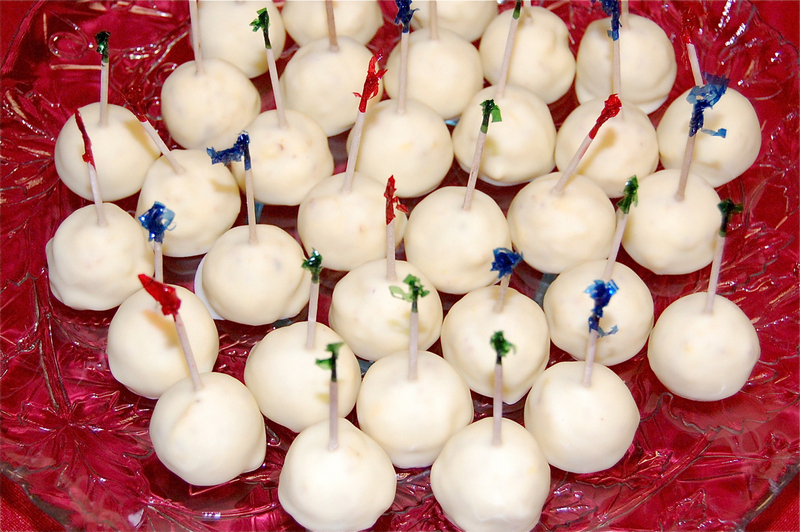 Once first half of centers are dipped, place sheet of bonbons in refrigerator to cool. Repeat with second half of centers. Store bonbons in airtight container in freezer or refrigerator. 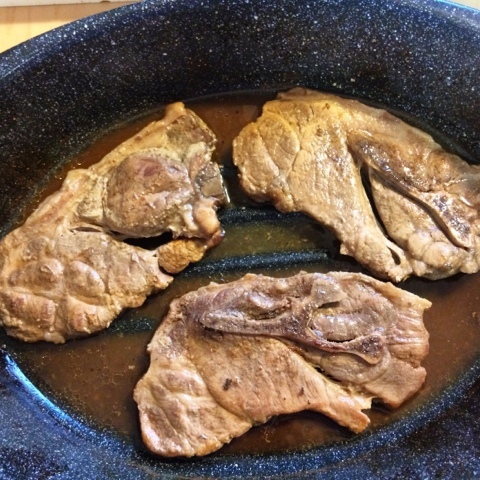 Serve frozen, chilled, or allow to sit at room temperature for several minutes before serving. Leave the toothpicks in the centers; once these bonbons warm to room temperature, they will be very soft, but they can still be moved by grasping by the toothpick. P.S. Please join me and the Land O'Lakes Kitchen Conversations bloggers – Becky from the Land O'Lakes Test Kitchen, Ree from The Pioneer Woman, Sommer from A Spicy Perspective, Maria from Two Peas and Their Pod, Brenda from A Farmgirl's Dabbles, Julie from The Little Kitchen, Bridget from Bake at 350, Jessica from The Novice Chef, Joanne from Fifteen Spatulas, and Jenny from Picky Palate – for the Land O' Lakes #CookieChatter Twitter Party on Thursday, December 4 from 7 - 8 PM CST. Follow the Land O'Lakes Test Kitchen (@LandOLakesKtchn) and Ree (@ThePioneerWoman) on Twitter, search for the #CookieChatter hashtag to follow along, and be sure to use the #CookieChatter hashtag in your tweets, and you'll be entered to win a holiday baking prize package from Land O'Lakes. There's been a kitten living in our bathroom right since the night before Thanksgiving. The kids named her Grace. Grace and her brother are late-season kittens born to Boxcar Kitty. Boxcar Kitty had kept her kittens well hidden until two weeks ago, when I spotted Grace by the cats' food dish. 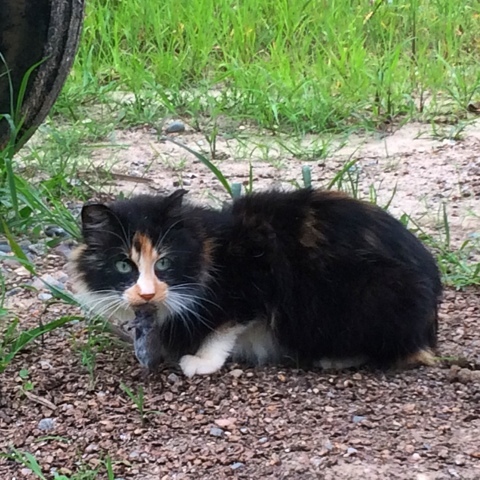 I knew Boxcar Kitty was a good hunter who was capable of providing for her kittens, but I started putting out extra cat food and milk for the cats in the machine shed. Since the arrival of our early winter, the rest of our farm cats have been hanging out in the barn, where it's warmer. I caught Grace's brother a week or so ago and moved him into the barn, but I couldn't catch Grace. Last Wednesday, Glen found Grace meowing nonstop in the machine shed and brought her into the barn warm up. But she didn't know her way around the barn and ended up falling in the gutter. We moved her into our milk house to warm up. But that wasn't enough to warm up her cold, wet little body. When I checked on her during chores, I could tell that hypothermia was overcoming her. So, I cradled her in a small pail of warm water until she started shivering again. That was a good sign, but I knew she had a long way to go, and I had a lot of chores yet to finish. So I carried her (in the pail of water) to the house and turned her care over to the kids. 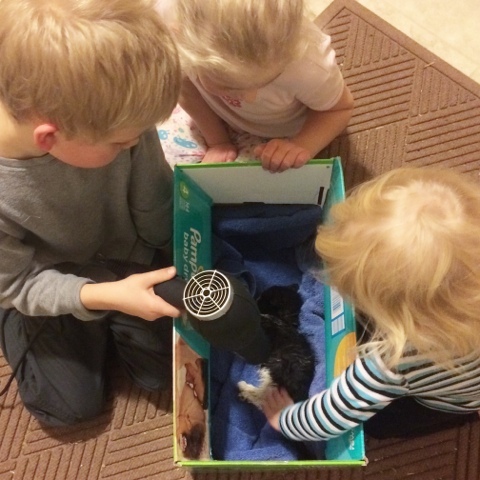 I helped them towel her off, set her in a box, and gave the kids the blow dryer with instructions to keep drying her until she was completely dry and fluffy. I crossed my fingers and went back outside. When I came back in later, there was a black-and-white ball of fluff looking up at me from inside the box. I told the kids they did a good job and that she might make it. They responded by asking if she could be our new house cat. The next morning the little kitten felt considerably warmer, so I offered her some food, which she promptly ate. I told the kids that was another good sign. Monika decided then that her name should be Grace. 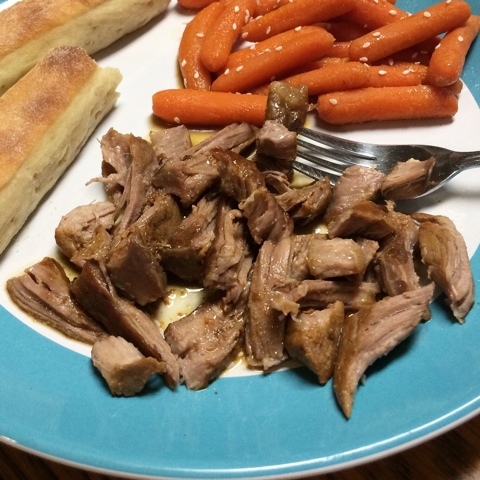 Grace's appetite has continued to improve since Thursday. But she has a lot of weight to gain. I'm guessing that she just couldn't eat enough to both grow and maintain her body temperature in this brutally cold weather we've had. Up until last Wednesday, Grace was an un-catchable, spit-fire. Now she starts purring non-stop whenever someone walks into the bathroom. 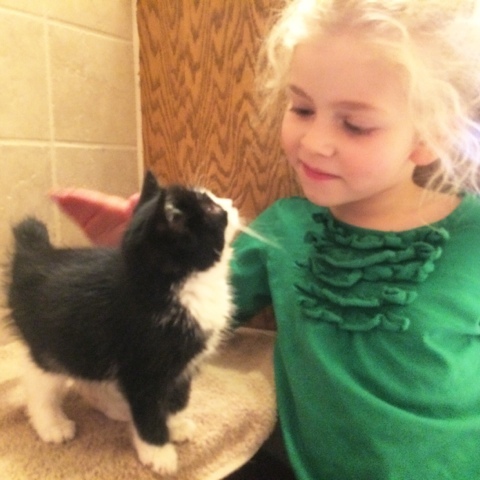 The kids adore Grace and have volunteered to feed her and clean her litter box. I'm warming up to the idea of a new house cat, but I'm not 100% sure. Even if Grace doesn't become a permanent house cat, she's going to stay inside at least until she's strong enough to go back outside. 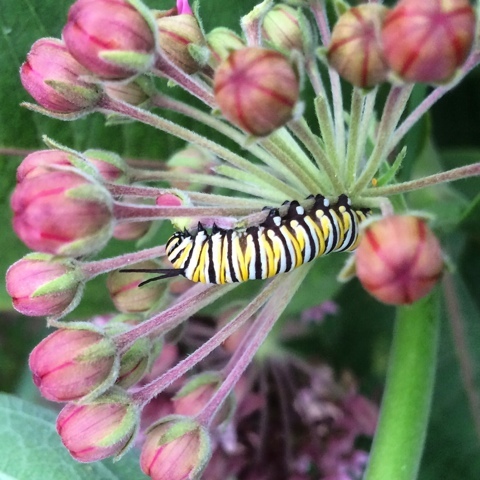 What started with the excitement of finding a monarch caterpillar on some milkweed buds (below) turned into a summer-long learning project for our entire family. At Bruce the Bug Guy's bug show, Bruce said that rearing monarch caterpillars was pretty easy to do. So when we found this one, we brought it back to the house with us, along with a couple milkweed leaves. While trying to figure out how best to take care of this caterpillar, I read that rearing can increase a caterpillar’s chances of making it to adulthood by nearly 90%. So we brought a few more caterpillars in and then a few more. 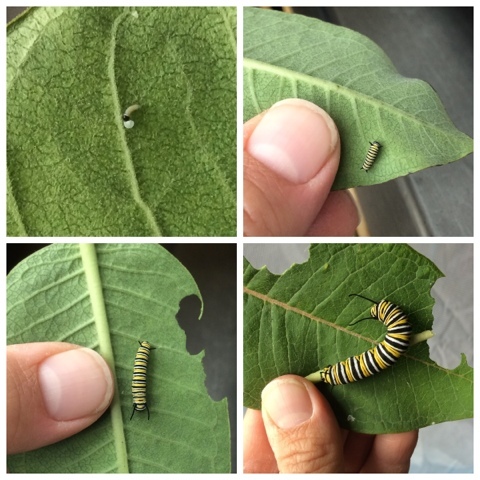 I accidentally brought a monarch egg in on a milkweed leaf, so we raised that caterpillar after it hatched, too. Rearing the monarchs gave us a chance to observe the caterpillars up close and provided an opportunity to learn about the monarch life cycle. It was also inspiring to think that maybe we were helping the monarch population increase, just a little. I've since learned that the best thing we can do to increase the monarch population is provide more milkweed and other flowering plants for monarchs to feed on. 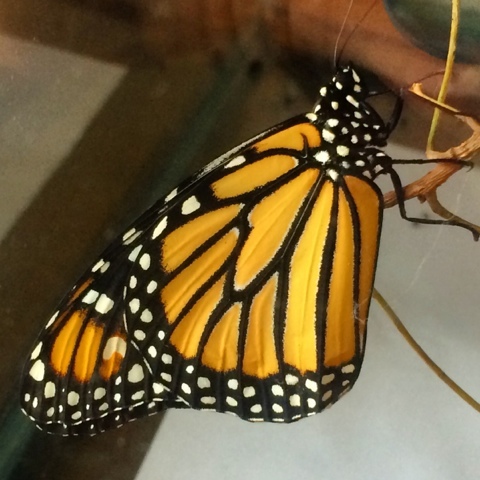 We hatched out several monarch eggs after I brought that first one in. 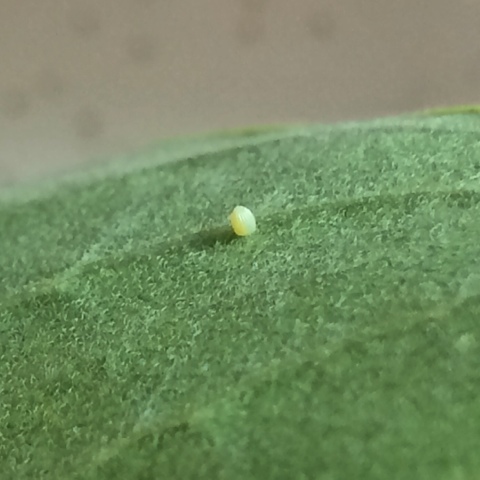 It's almost unbelievable that such tiny eggs are where monarchs get their start. 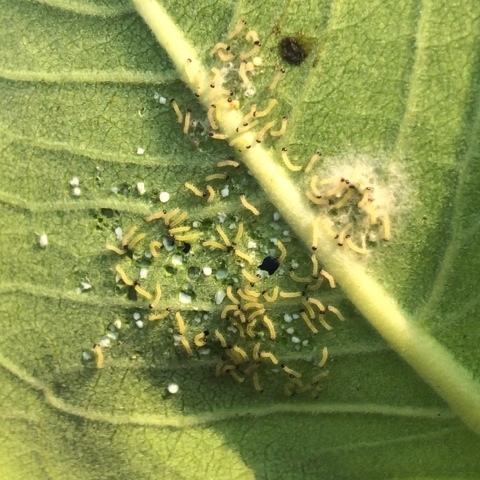 We watched as the newly hatched caterpillars ate their eggshells (called chorions) and then the tiny hairs on the bottom sides of the milkweed leaves. Then they graduated to eating actual leaves. They molted and grew like crazy. Then they repeated the process – molt and grow – three more times. We got to watch the caterpillars shimmy out of their old skin and emerge all wrinkly and ready to grow. 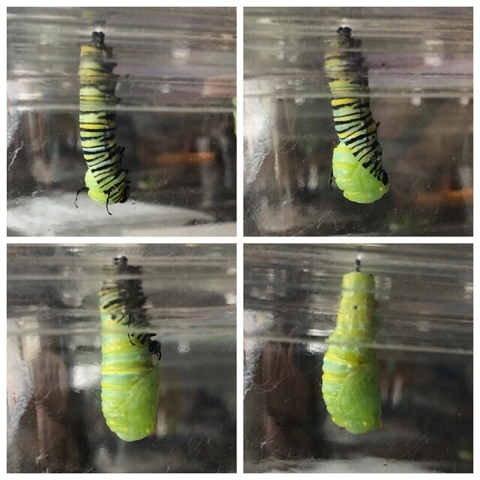 After the last molt, the caterpillars' appetite and rate of growth would really increase. They filled out their velvety, wrinkly skin to become the plump caterpillars everyone thinks of when they think of monarch caterpillars. One thing we learned is that monarch caterpillars' color patterns vary. Most have more black, but some have more white. 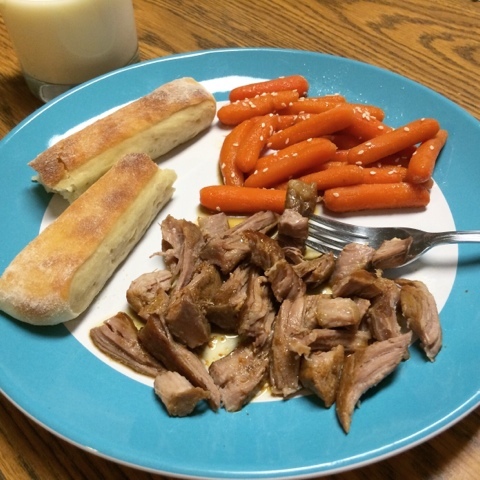 When it seemed like they possibly couldn't eat anymore, the really cool part started. The caterpillars left the milkweed and started climbing. Most selected a spot on the covers of the containers we kept them in. The caterpillar below chose a branch. Some would crawl around for hours, I assume trying to pick the perfect spot; others climbed up, picked a spot within minutes and started building their silk buttons. Once their silk buttons were formed, the caterpillars inched forward until they could grab the button with their back feet. Hanging on tight, they would slowly let go with the rest of their feet and dangle down into a J shape. After 12-24 hours hanging in J, the caterpillars transformed into chyrsalides. This is the part that prompted lots of questions from Dan and Monika, like, "How do they know when to make their chrysalis?" 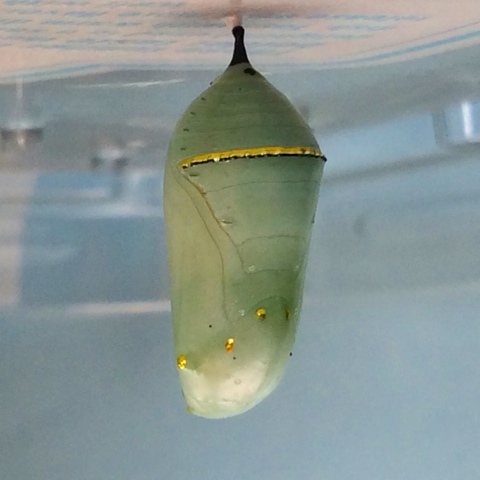 Ten days later, the chrysalides darkened and the wing patterns of the butterfly inside became visible. 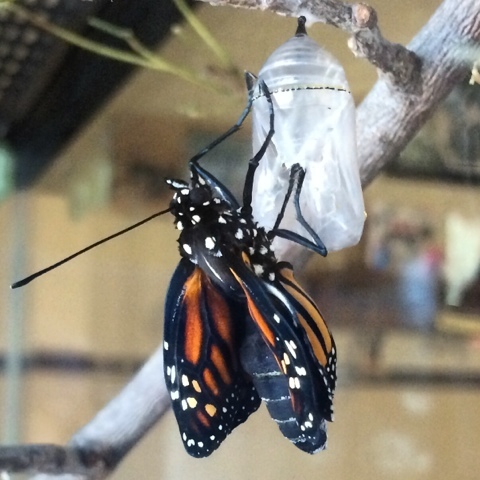 Like the forming of the chrysalis, the butterflies' emergence from the chrysalides happens very quickly. We still haven't watched a butterfly emerge from the very start. Dan and Monika were really surprised that the shell of the chrysalis was clear. 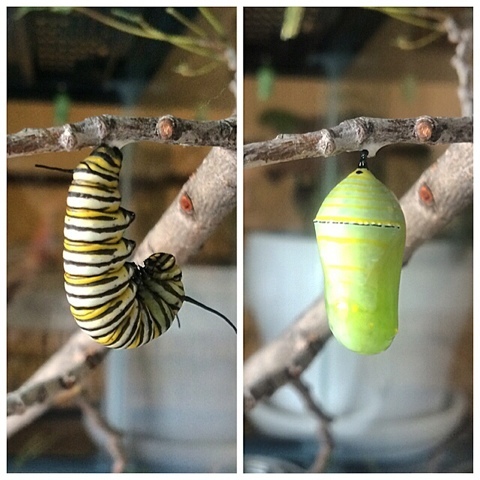 They thought it was tinted green, because for most of the pupal phase, the chrysalis looked green. When the butterflies emerge, their wings are soft, small, and wrinkled from being tucked inside the chrysalides. Their abdomens are full of fluid. The butterflies contract their abdomens, pumping the fluid into their wings to expand them. Once their wings reach full size, the butterflies hang with their wings pointing down for hours to let their wings harden. The first time we watched a caterpillar pupate, I didn't take any pictures or videos. I just wanted to watch without watching through a lens. Dan, Monika, and I sat together and just watched. Before the transformation started, I had the kids hypothesize about how they thought the caterpillar would form its chrysalis. (I had seen pictures of the process, but never watched it happen in real life.) Neither child guessed that it would happen the way it did. Once the pupa has emerged, its soft body contracts and then its skin hardens into a protective shell. A couple hours later, the gold markings appear. The word chrysalis comes from the Greek word for gold. 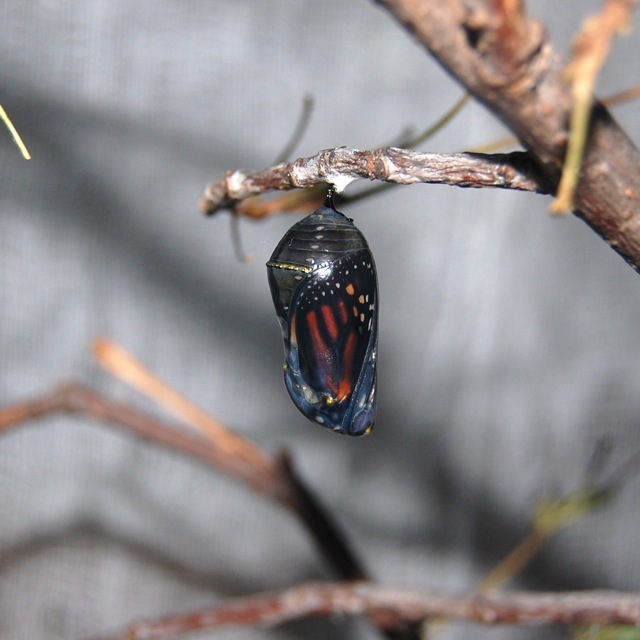 After emerging, it is imperative that the butterfly hangs onto its pupal case or something else, so that its wings can expand. If it falls before that and fails to crawl back up, its wings will harden with permanent wrinkles or bends. We released all of the monarchs we reared in our yard. 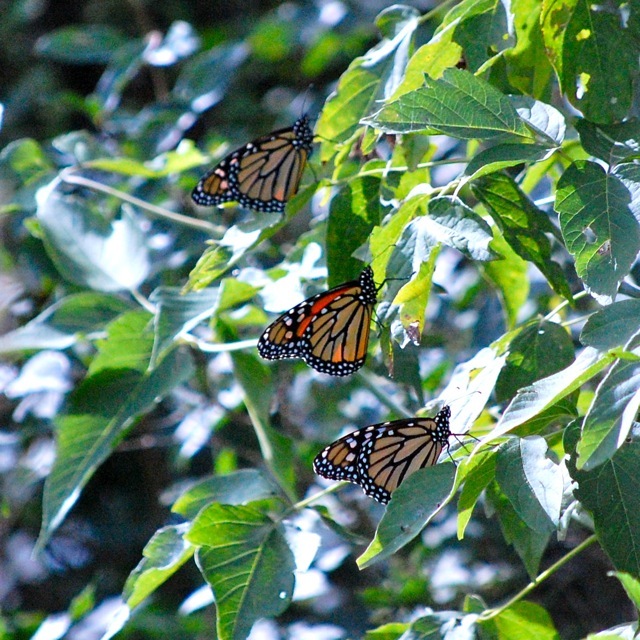 As summer progressed, it seemed like we saw more and more monarch butterflies flitting around. I even saw them resting near manure in the cow yard; at first I was concerned, but I learned later that they meet their mineral needs by drinking from puddles in mud and manure. One day in late August, I went out to check for calves in our dry cow pen. I saw a butterfly zip around the corner of our windbreak. I thought it was the Tiger Swallowtail I had watched in that same spot a few days earlier. I followed, hoping to get a better picture of it. It wasn't the swallowtail; it was a monarch. As I followed it a bit further, I saw that there were too many monarchs to count resting in the trees and flying out over our alfalfa field (which was once again blooming due to a rain-related harvest delay). It was so cool to see so many monarchs. I've heard others say, too, that they've seen lots of monarch caterpillars and butterflies this summer. Hopefully that means the monarchs have had a good summer and maybe we'll see population numbers rebound. 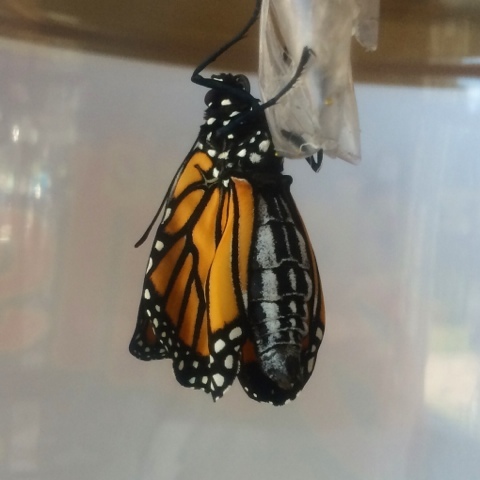 We won't know until they complete their migration to Mexico and the monarch watchers there can determine how many made it. 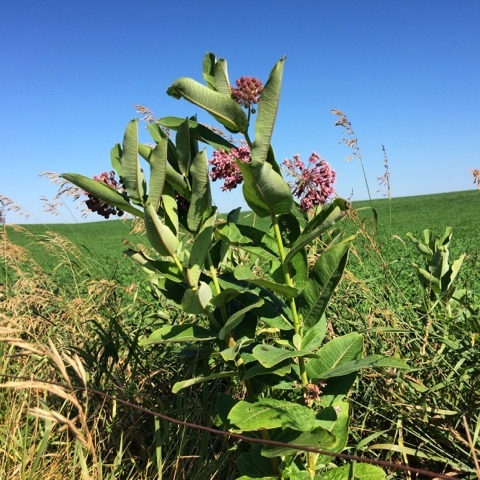 We spent so much time watching milkweed this summer that Dan and Monika can now spot a milkweed plant, like these ones in our fenceline, from an acre away. 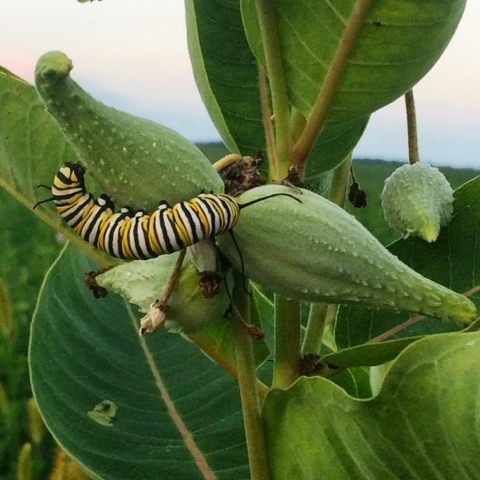 Even Glen started noticing the milkweed around the farm and checking it for caterpillars. 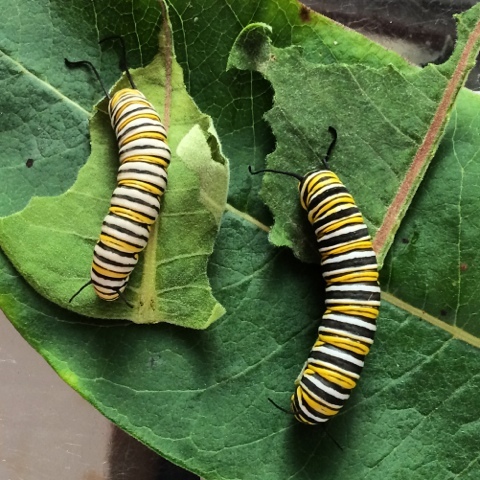 Did you know that the many species of milkweed are the only plants monarch caterpillars can eat? That's just one of the facts Dan and Monika learned about milkweed. 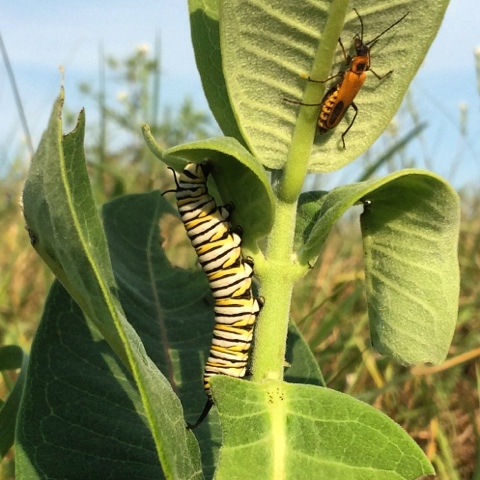 One of the reasons monarch numbers are declining is due to a decline in the amount of milkweed across the nation. Milkweed blossoms are both beautiful and very fragrant. I think they smell even better than lilac blossoms. The blossoms also provide food (nectar) for monarch butterflies. 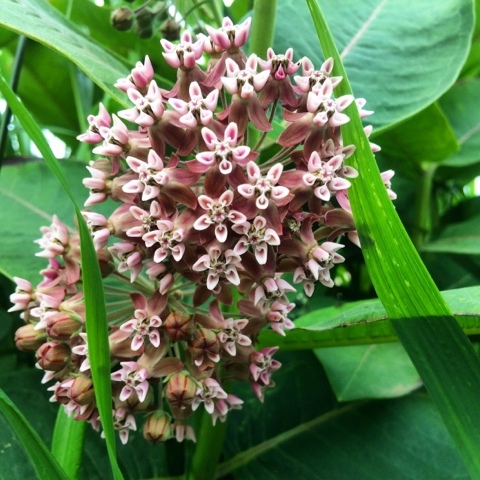 Milkweed gets its name from its sticky, white sap. Milkweed plants and sap are toxic to species which are not adapted to consume them. Our cows will occasionally take a bite of a milkweed plant, but you can always see where they spit the leaves back out. Milkweed's large seedpods are one of the traits I remember vividly from my childhood. Like the area where I live now, milkweed grew abundantly along the roadsides. At that point in my life, I didn't know that milkweed and monarchs went together. I just thought sticky, white sap and the seedpods were cool. 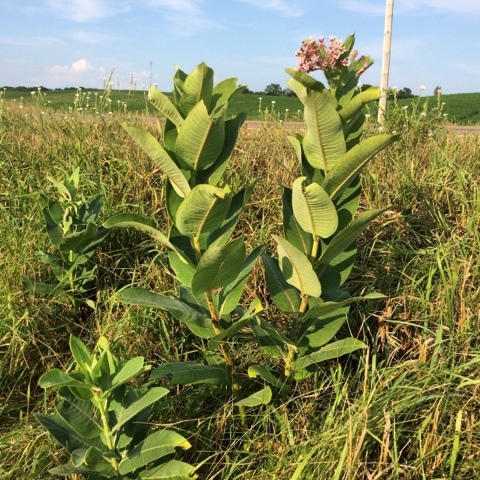 We have a number of small stands of milkweed, like the one pictured below, growing in our roadside ditches. We have even more growing in the fenceline between the pasture and cropland. 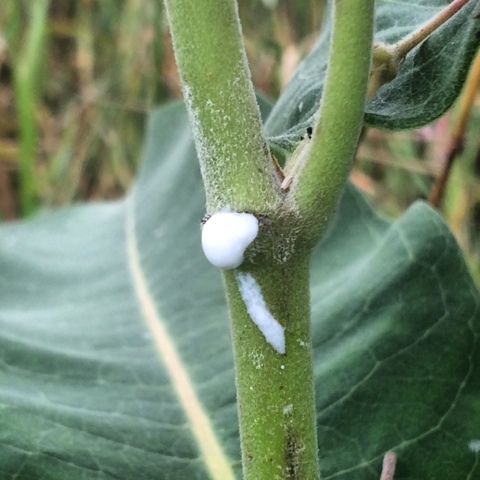 We found eggs and caterpillars on milkweed in both locations this summer, but there were many more caterpillars and eggs on the fenceline milkweed. I also found some Swamp Milkweed growing by one of the ponds in the pasture. There are a couple dozen different species of milkweed. I can't tell most of them apart, but I can differentiate Swamp Milkweed. First, because it grows in wet soils. 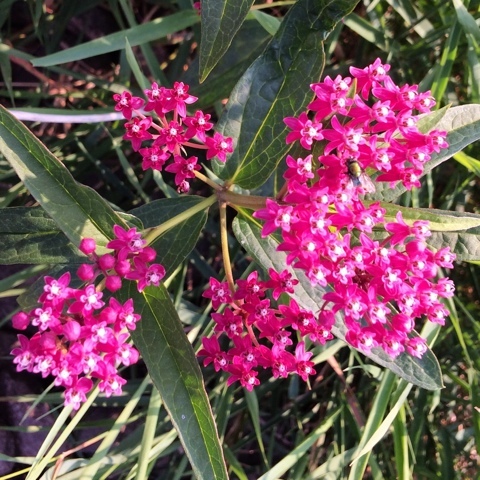 Second, because it has long narrow leaves and brighter pink flowers. It smells just as good as upland milkweed species. Third, Swamp Milkweed has long, slender seedpods. 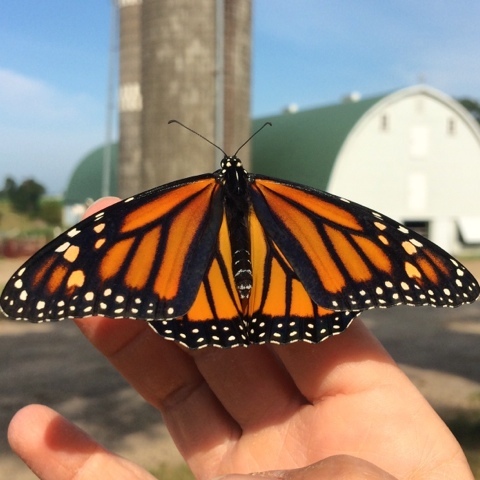 One thing I decided during our monarch project this summer is that, next summer, I will rear fewer caterpillars and make more of an effort to increase monarch habitat around our farm. There are several areas near the pond and in the grassed waterways that I'm planning to convert to milkweed and the other native flowers butterflies need for feeding and reproducing. While we were busy looking for monarch eggs and caterpillars, we discovered that milkweed provides food and habitat for several other critters, like these Red Milkweed Beetles. And this bug, which looks a lot like a Large Milkweed Bug, but not enough for me to make a positive identification. It might just be some other sort of beetle/bug who stopped for a rest. 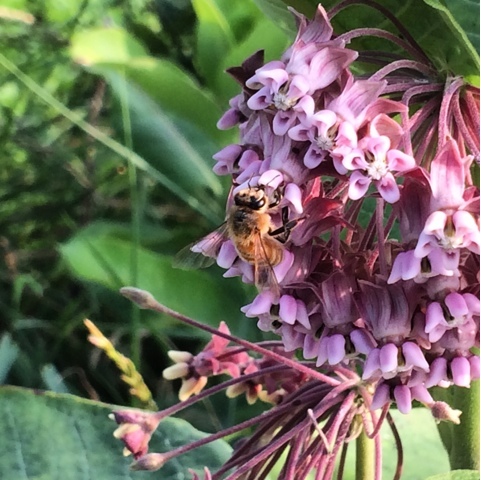 We found lots of other pollinators, namely bees and butterflies, like this bee collecting nectar from milkweed blossoms. 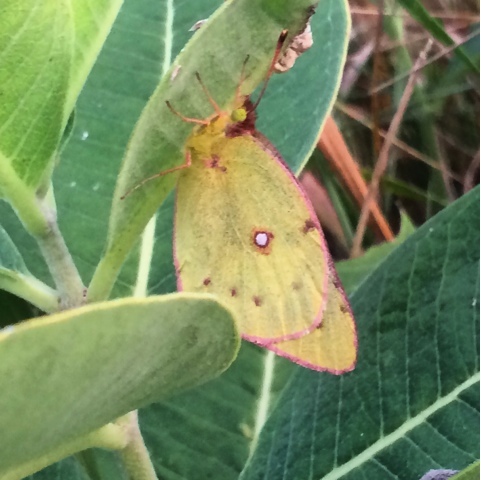 And this Pink-Edged Sulphur butterfly, who appeared to be resting there for the night. Lots of more commonly known insects inhabited the milkweed stands – grasshoppers, aphids, ants, and ladybugs. I presume the ants and ladybugs were there to feast on the aphids. Monarch caterpillars weren't the only caterpillars, either. We saw several tussock moth caterpillars, like this newly hatched cluster. 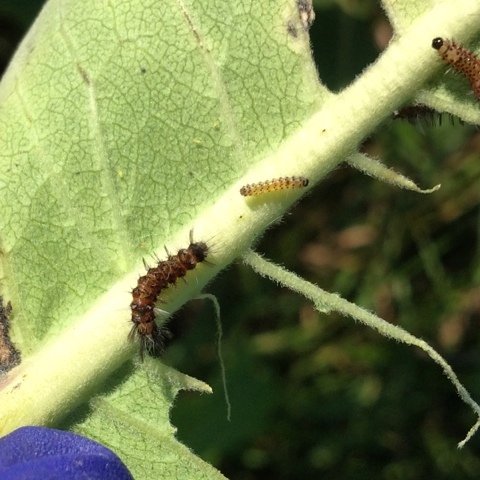 And these older tussock moth caterpillars, which will eat milkweed leaves right down to the ribs. This caterpillar looks like a leopard or tiger moth caterpillar, but I'm not sure which. 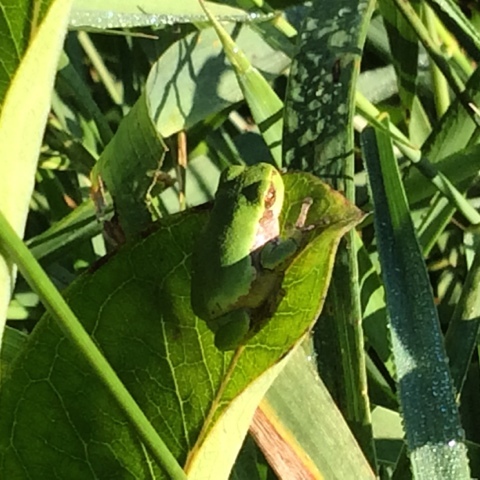 It was pretty cool, but I was even more excited to spot the treefrog next to him. I absolutely love frogs – after cows, they're my next favorite creature. That treefrog wasn't the only one. 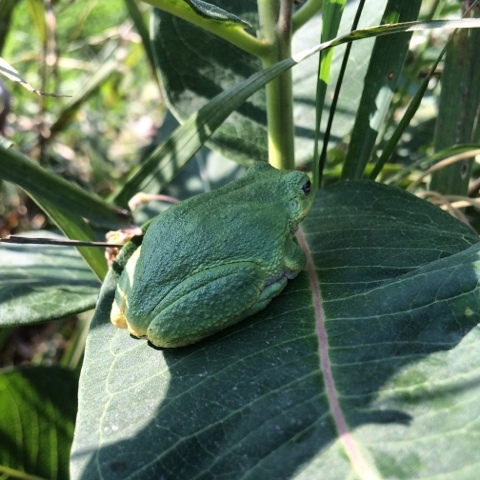 We saw treefrogs almost daily, hanging out on milkweed leaves, I assume waiting for their next meal. With all the insects that milkweed attracts, the eating must have been good. The treefrogs made our monarch project extra special for me. 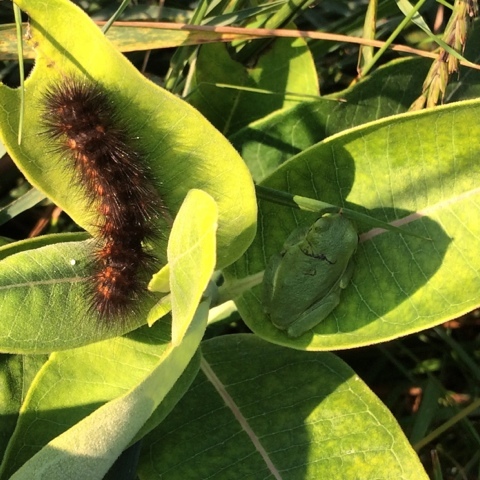 We did most of our milkweed watching while we were getting the cows in from pasture, so I got to watch cows, frogs and monarchs all within minutes of each other. And I got to do all that while hanging out with my kids and helping them understand more about the natural world around us. I'm definitely adding monarchs to the list of my favorite creatures.